Since their debut, GFriend has made quite an impression on the K-pop. They have become known for their strong vocals, challenging choreography, and their unique sound. However, as their most recent release, Rainbow, demonstrates, GFriend has hit a plateau in their music that poses problems as they continue. GFriend has one of the most distinct sounds in the current K-pop landscape. They balance mid-2000s pop rock, with the edge and strength thereof, with a soft 1990s R&B sound. They blend piano with percussion, violins with guitar licks. As a result, they maintain a youthful image that never dips into the aegyo territory that most girl groups with a younger image live in. It makes their songs immediately recognizable as GFriend– a core of steel couched in feminine innocence. However, as Rainbow lays bare, there is a point where having such fealty to such a distinct sound becomes problematic for a musical act. It is what I expected going into a GFriend release. Powerful vocals, mellow instrumentation with touches of guitar, brass, and a lot piano and strings, all carried by youth and raw, earnest emotion. It is so much that what I expected that it became uninteresting. The entire EP sounds like variations on a theme, one that is already very familiar. 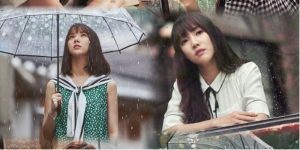 It doesn’t take long for Rainbow, despite GFriend’s one a of a kind sound, to become stale and blase. Nowhere is that more clear than with the back-to-back songs “Love Whisper” and “Summer Rain”. Rainbow is a re-release of the earlier EP Parallel, with “Love Whisper” and “Summer Rain” as the original and new title tracks, respectively. By placing them one after another, it is impossible to ignore just how similar they both are. The choruses share similar structures. They follow the same tempo. Both are built primarily around a drum chord that is softened with synths or strings, and more delicate vocals. And driving the nail in the coffin is the fact that the drum chord in question is nearly identical from “Love Whisper” to “Summer Rain”. That pattern of frustratingly identical music carries through all of Rainbow. Every track follows in the same footprints as the title tracks. The entire mini is crammed full to bursting with lush, feminine mid-tempo songs, barely distinguishable through each tracks’ identifying flourish of choice. There’s the more aggressive percussion on “Red Umbrella”, the post-disco synths of “Ave Maria”, “Falling Asleep Again” as the pure ballad, and the slightly funky chords on “Life Is A Party”, a song pretty much guaranteed to make you start hugging the wall like your life depends on it. And the more listens through Rainbow, the more those small differences fade into a sense of overwhelming sameness. That sameness is amplified by the realization that the tracks on Rainbow do in fact contain elements from previous GFriend singles. “One Half” in particular pulls from both the opening of “Rough” and the main chord of “Me Gustas Tu”, but similar chords are used all across Rainbow. Ironically, the most unqiue song on Rainbow is “Rainbow” itself. While the rest of the mini plays it safe, “Rainbow” leans into their rock edge, kicking off with a rather rollicking guitar riff. That is then matched by a passionate vocal performance, marked with repeated runs up and down the treble clef. 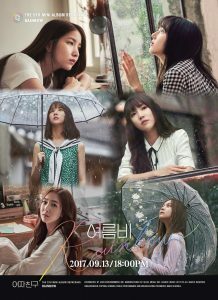 As GFriend clings to their faith in a happy ending, “Rainbow” becomes almost desperate to reach that light at the end of a tunnel– or after a rainy day. Most significantly, “Rainbow”, for all its differences from the rest of the mini, is still unmistakably GFriend, proving their sound doesn’t have to lock them in. It’s a truly stunning song that proves GFriend can do amazing things when let out of their comfort zone. From a financial standpoint, I understand why Rainbow sounds like it does. “Fingertip” saw a sharp decrease in single sales, a drop of almost 50%. Album sales remained steady, but in the current musical landscape, a group needs to attract casual listeners, and returning to an earlier sound would seem logical. However, Parallel saw a continued drop in single sales, this time accompanied by a drop in album sales. This hammers home the risks clinging to a specific sound, like GFriend is. Audiences want a group to have a signature sound, not for them to sound the same. Rainbow marks the seventh time GFriend has released albums with near-identical sounds. The welcome has officially been worn out. Lean into rock, shift towards R&B, go full electropop; I don’t care. Just don’t release identical album number eight.